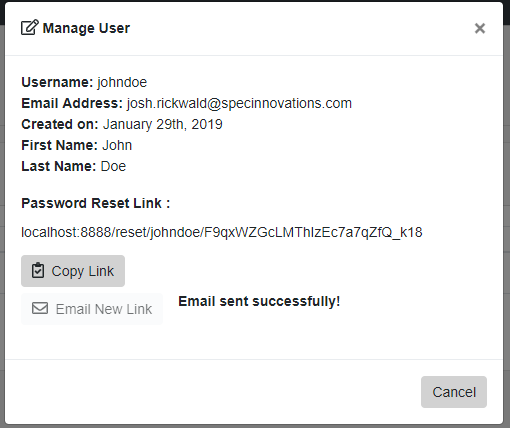 The Support Dashboard allows a user with Admin or Support access to send/copy users' password reset links and activation links - that way users who cannot remember their passwords can simply contact their support team or an administrator, and their password links can be sent to them without inconvenience. If you are a user with Super-Admin(database administrator) access, you will see the Support Dashboard in the toolbar of your Admin Overview Dashboard. If you are a user with Support access, you can navigate to the Support Dashboard via the button on the toolbar of your Organization Dashboard. 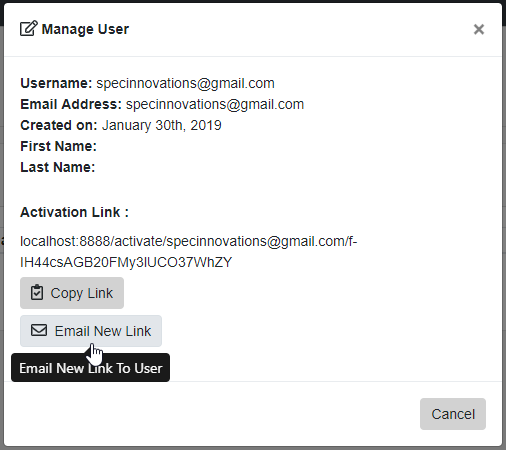 Search for users using either their first name, last name, both, username, or email. Click on the 'Key' button in the 'Manage User' column to open the dialogue for sending reset/activation links. Manage User dialogue, you can click 'Reset Password' to generate a new password reset link and send it to the user. From this view, you can copy the password link to your clipboard so that you may give it to the user directly if needed. From this view, you can copy the activation link to your clipboard so that you may give it to the user directly if needed. The Support Dashboard allows a user with Admin or Support access to send/copy users’ password reset links and activation links – that way users who cannot remember their passwords can simply contact their support team or an administrator, and their password links can be sent to them without inconvenience. Click on the ‘Key’ button in the ‘Manage User’ column to open the dialogue for sending reset/activation links. 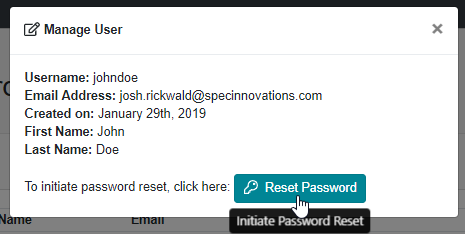 Manage User dialogue, you can click ‘Reset Password’ to generate a new password reset link and send it to the user.